We’re sorry. 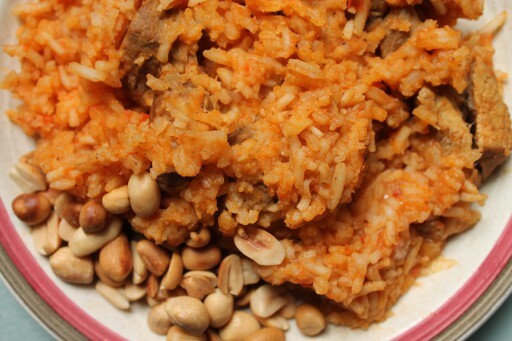 What you really want to read about is authentic jollof rice. You’ve tried it before at a West African festival, or at your friend’s mum’s house or even read about it online and what you really want to know is how to make it yourself. So did we…but being Indian, we couldn’t help putting our spin on it. Indian people just can’t help themselves. Baked beans are great…with fried onions and cumin. Cheese on toast is wonderful…with green chillies. And don’t get us started on the beauty of the Masala Omelette. We have a problem, sure, but we like to think it’s about putting ourselves into the food we eat. Besides, we were very restrained with this dish. We could have added lentils, green chillies, cumin, turmeric, coriander seeds, black cardamom and cinnamon. Hmm. Maybe next time. Heat the oil in a non-stick pan. Saute the lamb on medium-heat until browned. Then turn the heat all the way to low, add the water and cover for 20 minutes until just cooked and tender. Set aside. Blend the tomatoes, scotch bonnet, onion and pepper until thoroughly processed. In the largest pan you can find, heat the palm oil (or whatever oil you prefer). When hot, add the blended tomato sauce (be careful!) and heat until the sauce separates from the oil. Add the stock cubes, stock, rice, water, garam masala, spices and salt to taste (we started off with 1 tsp). Stir thoroughly. Bring the heat down to the lowest setting. Cover the pan with foil and then set the pan lid on top to trap the steam. Cook for 30 minutes, stirring every 10 minutes so that the rice doesn’t stick to the pan. When you are in 10 minutes in, stir in the lamb so that it absorbs some of the flavour. When the rice is fully cooked, test the salt and adjust if necessary. 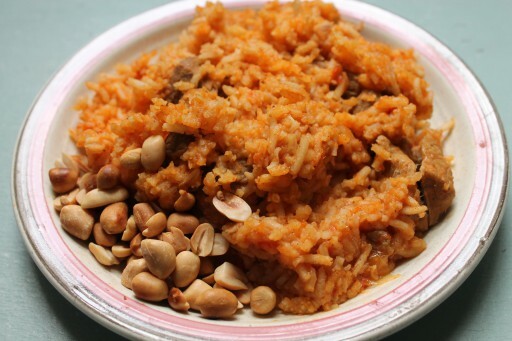 Enjoy with peanuts, fried plantains, whatever you feel like!